The first renderings for the Handel Architects-designed skyscraper developed by the Durst Organization at 29-37 41st Avenue in Queens have been revealed. While the tower falls short of its 915-foot-tall predecessor by SLCE, Handel’s 751-foot-tall building will still dwarf the clock tower at its base. 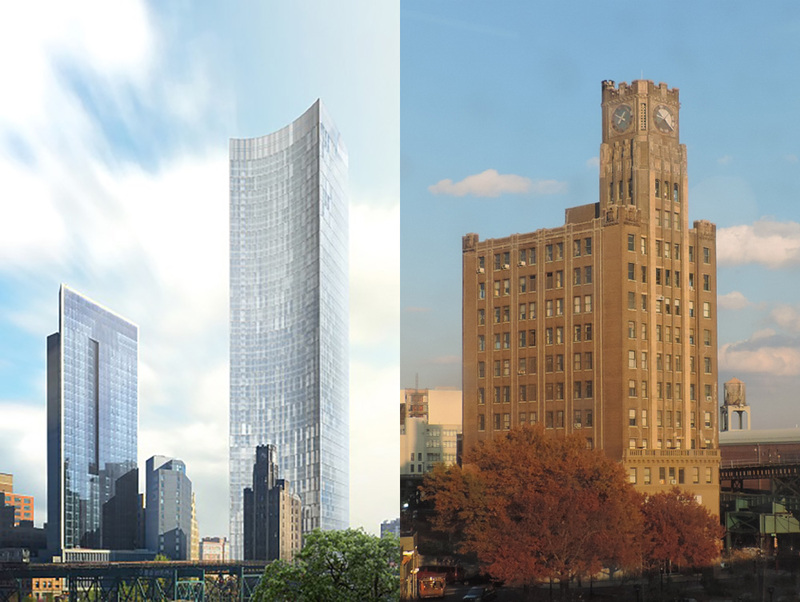 The renderings, first obtained by CityRealty, show a massive concave tower, sheathed in a glass curtain wall, set back from the rear of the 90-year-old landmarked Clock Tower. Crowned Queens Plaza Park by prior developers Property Markets Group and the Hakim Organization (before Durst snatched up the site for $175 million in 2016), the 978,000-square-foot development will hold office space, retail, and 958 residential rental units. According to the project’s website, 300 of the units will be affordable, and Selldorf Architects will be handling the tower’s interiors and amenity spaces, complete with an outdoor pool, 20,000-square-foot gym, library, co-working spaces and a demonstration kitchen. A half-acre public park will also sit in front of the residential entrance. Construction on the 70-story skyscraper is already underway, and CityRealty recently visited the site to photograph the cleared area around the base of the Clock Tower. Additionally, the locations of the ground-floor retail and the sharp, almost bat symbol-like shape of the building’s crown have been released thanks to the axonometric zoning diagrams released by the New York City Department of Buildings. 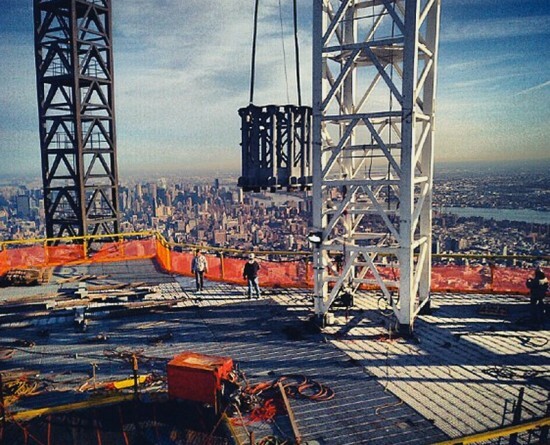 The project’s central concave curve, the tower’s defining feature, should span nearly 200 feet from end-to-end once completed. The 11-story, neo-gothic Clock Tower was built in 1927 and housed the former Bank of Manhattan, and Durst has promised to restore the building as part of the redevelopment. While the tower was previously a notable standout in an area increasingly inundated with glass facades, the Handel-designed addition should blend into the surrounding urban fabric a bit more, even if the Clock Tower itself will remain distinct from the tower. There’s also the concern that the skyscraper’s curved form could trigger a Walkie-Talkie-esque fiasco, in which the reflective properties of that building ignited fires, but hopefully Handel has learned from Rafael Viñoly’s mistakes. If finished before the 984-foot-tall City View Tower, also in Long Island City and slated for a 2019 completion, Queens Plaza Park would take the distinction of Queens' tallest building. 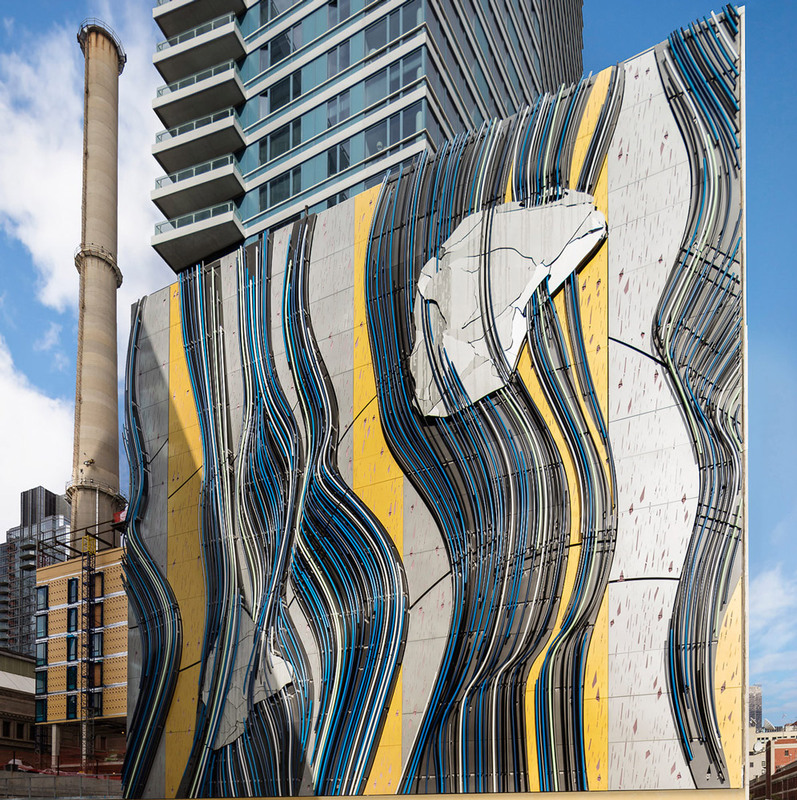 Flows Two Ways by Stephen Glassman Studio is one of the most innovative new public art wall projects in New York. The walls of the city have a long and complicated history as a site for public art that includes 19th century classical Beaux Arts reliefs, WPA scenes on (and in) libraries, hospitals and public housing, and the graffiti that covers buildings all over the city. Furthermore, in the 1970s the loosely organized group City Walls created opportunities for artists to use blank, lot line facades all over downtown Manhattan, particularly in Soho and Noho. Only two City Walls murals remain in 2016 but there were many large works by artists such as Allan D’Arcangelo, Mel Pekarsky, Tania Lewin, Robert Wiegand, Todd Williams, and Forrest Myers. This was a moment when bare, unpainted walls were plentiful downtown and City Walls helped created a template and process for covering them with large graphic images. These artists' projects grabbed the public’s attention and helped define the art of Soho in the 1970s but, sadly, their work only became a template for commercial advertising signs. Except for the late, lamented 5 Pointz graffiti wall in Queens, there haven't been many wall projects of interest in New York since the 1970s—or until now, with Flows Two Ways. The Stephen Glassman project is sited on a new passageway few New Yorkers even know exists. The work is not a painted mural but a raised sculpture that measures sixty-by-sixty feet. It sits on a narrow passageway between the BIG-Bjarke Ingels Group-designed Via 57 West building and the Helena by FxFowle. It was commissioned by the Durst Organization, the owners of both developments. The piece was created through a truly 21st-century process of prefabricated construction. The mural is composed of colored aluminum, stainless steel, and rolled metal tubing. Furthermore, the layered eight-story, 32,000-pound jig-saw puzzle is composed of a stainless-steel mounting matrix embedded into the existing Helena wall, 35 interlocking aluminum panels, nearly 400 sixty-foot pipe clusters rolled and flowing in three axes, and faceted metal “boulders.” A sophisticated sliding plate system—which largely floats the 16-ton piece off the building—accommodates thermal expansion and forces generated by wind, rain, snow, and ice loads. It is effectively a panelized façade. 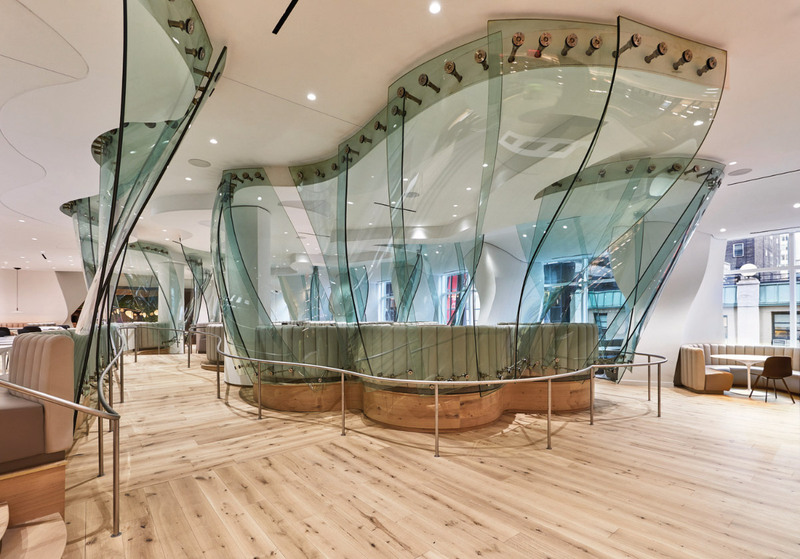 To develop this technologically complex sculpture, Glassman used a team of engineers from Arup, architects, and designers to craft its layered construction and anchoring system. The artist’s intent for the work is to evoke “an enduring regard for earth and nature and a love of New York.” It cascades down and up the facade; Glassman says it replicates “the dualities of flowing and falling.” By playing with the sun’s changing angles, the artwork mimics the Hudson River’s glow at sunset. In particular, the artist hopes the work will direct the eye of the viewer upward to the sky rather than the confined, dark space of the narrow alley. The sculpture’s palette, derived through color studies of the historic Hudson River school of painting, imbues the passageway with an organic counterpoint to the surrounding steel and glass built environment. In fact, the majority of units facing onto the artwork are subsidized middle-income apartments that, without the colorful work, would be looking onto a narrow passageway's drab sheer concrete wall. The sculpture points to a new type of composite and prefabricated construction that can transform a blank vertical wall and otherwise dead space into a colorfully vibrant urban space. The last time Robert Durst—the accused killer and heir to one of New York City’s most influential real estate dynasties—was behind bars in the Southwest, he was on trial for the murder of his neighbor, Morris Black, in Galveston, Texas. That time he was caught after swiping a sandwich and some Band-Aids from a Pennsylvania supermarket while wearing cross-dressing attire. Now, he is donning an orange jumpsuit once again. 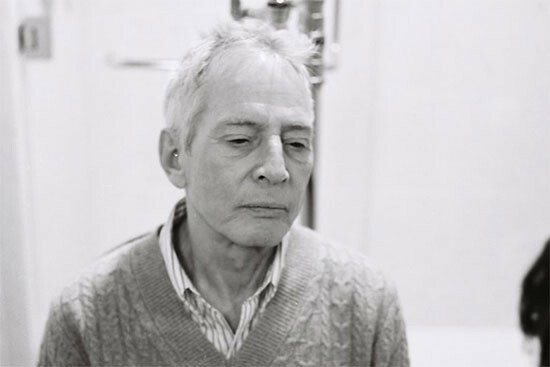 A day after the finale of the HBO documentary about his life, The Jinx, he was charged with the murder of his friend, Susan Berman, and later brought into custody. Curbed reported that a few weeks ago, “seven police officers raided Durst’s Houston condo, the Robinhood, eventually departing the 14th-floor apartment with two cardboard boxes.” Apparently the 71-year old suspect has been living in the high-rise for a number of years, and perhaps his belongings may yield some clues or evidence for the prosecution, maybe some misspelled letters addressed to Beverley Hills? According to Curbed, neighbors said that Durst would occasionally attend homeowners’ association meetings and chitchat about real estate news. 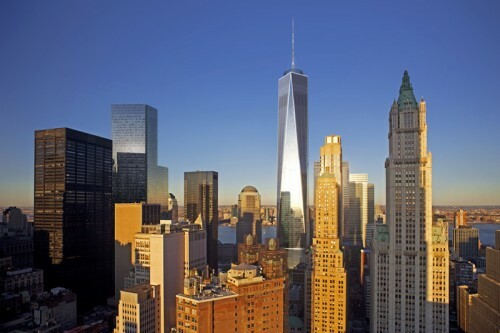 The Durst Organization owns more than 9.5 million square feet of commercial and residential space in Manhattan, including 4 Times Square, Bank of America Tower in Bryant Park, and a percentage of One World Trade Center. Murderer or not, he’s got real estate in the blood. [beforeafter] [/beforeafter] The so-called "courtscraper"—a marriage of the European courtyard block and the American skyscraper—by Bjarke Ingels Group (BIG) is rapidly rising on New York City's Hudson River waterfront. Officially called West 57 and under development by the Durst Organization, the 870,000-square-foot rental tower will stand 32-stories tall on the western edge of the starchitecture-studded 57th Street. BIG recently shared this construction view showing progress as of June 9, and we overlaid a model of the finished tower over top of it to give it a little more scale. View the before and after by sliding back and forth on the image above. The building is expected to be complete in 2015. 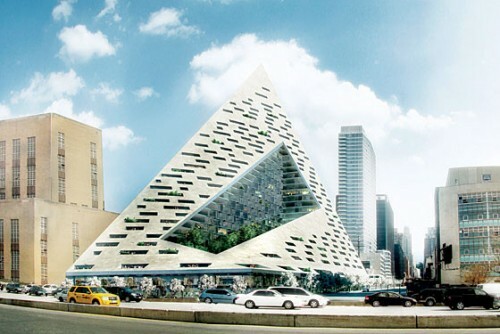 It took some negotiating, but New York City Council has approved Durst Fetner’s plans to build West 57th, a 750-unit residential development designed by Danish architect, Bjarke Ingels. 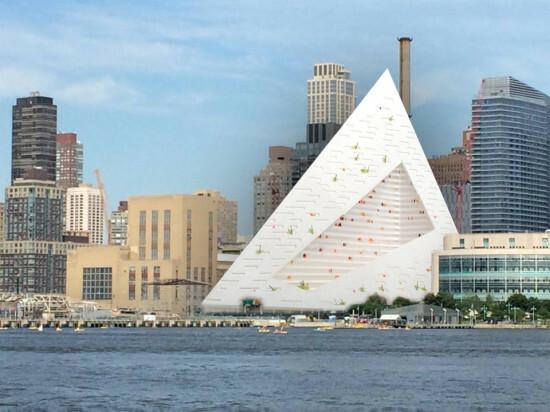 Crain's reported that the 32-story pyramidal “courtscraper,” sandwiched between 11th Avenue and the Hudson River, will consist of 750 rental apartments, with an additional 100 units in a converted industrial building. An early point of contention stemmed from what city council viewed as an inadequate plan for income-restricted housing, which will only be affordable for 35 years. While Durst Fetner didn’t budge on this issue, they did agree to donate $1 million to an affordable housing fund. The Durst Organization and the Port Authority of New York & New Jersey released a handful of new interior and exterior renderings of a value-engineered version of original designs for One World Trade. Clearly the long-term maintenance argument won out over David Childs' proposal for a sculpture-clad spire instead of a simple antenna. The resulting design seems far more efficient, if not aesthetically complete. Noticeably absent is Silverstein's yet-to-be-leased towers Two and Three, which won't rise until an anchor tenant is found. But neither collapsed cranes or a fire this morning will slow the tower from its relentless climb. Bjarke Ingels' star-studded ascendancy to New York architecture fame was checked last night as Community Board 4's land-use committee had its first look at Durst Fettner Residential's planned W57 tower in Hell's Kitchen. Already sobered by a two-hour discussion of planned zoning changes only blocks from BIG's courtyard-skyscraper hybrid, the board quietly sat through Ingels' signature multimedia show detailing the strenuous process that guided the sloping tower's design. A light crowd filled the room, with the Durst contingency of architects and developers huddled in the back corner awaiting their turn in the spotlight. After a quick shuffle to reorient the room to the wall-projected presentation--a move requiring Councilwoman Gale Brewer to reluctantly switch seats--Douglas Durst introduced his starchitect: "We've been getting a lot of media attention lately thanks to our swashbuckling architect." And how! But Durst was clearly impressed with his new building, "After many false starts, I think we've finally found a winner." After a brief review of BIG's built work, a barrage of immaculately detailed renderings, and a slick fly-by video of a traffic-free West Side Highway, the board got down to work dissecting the project in detail, immediately jumping onto the buildings signature form. "Is this thing visible from outer space?" one board member jabbed. "When is it approved for take-off?" chimed another. Such a reaction is what Durst anticipated from the introductory meeting. The night's presentation served as a preemptive discussion to take off the building's edge and move the conversation on to the nuts and bolts of development. The Durst and Ingels team responded to clarify questions about W57, suggesting a 130,000 square foot cultural space could be filled by the International Center for Photography, including a small photography school and showroom. The team said they were looking for a "real" grocery as a 30,000 square foot anchor tenant along the river. The remaining retail space would contain small stores to maximize sidewalk life. "West 57 defines the urban perimeter," Ingels told AN in a telephone interview this week. With its adjacency to the Hudson River greenway, "It's an interesting hybrid between public and private spaces." The central courtyard is elevated two floors, allowing treetops in the courtyard to be seen from the park while providing views of the waterfront. Ingels explained that W57's manipulation of the floor area ratio (FAR) allowed him to insert the courtyard. 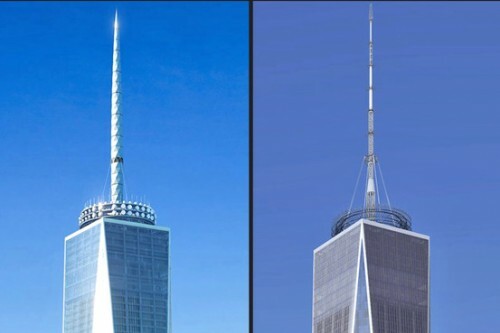 "We flooded the entire FAR at the base and chose to distribute it differently as the tower rises, shifting the center of gravity to the east." Still, the community board pressed their tripartite concerns of contextual sensitivity, affordable housing, and green space. Board members were unsure that W57 was about Hell's Kitchen. "What can you offer the community besides iconic architecture that could be plopped down in Milwaukee or Sante Fe?" one board member asked. Others disliked a proposed driveway between W57 and Durst's already-built Helena tower next door, worrying it would set the building off from the city like an island. Some took issue with the building's 450-foot pinnacle-height, saying it would overwhelm 58th Street, but Ingels insisted that the steep slope of the building would mitigate the height's impact. Always a sticking point with new residential projects, community members requested that 20 percent of affordable housing proposed by Durst for the 650 to 700 unit tower to remain affordable in perpetuity, a condition the developer has not agreed to. Brewer said the community would fight for increased green space, since the central courtyard is planned for residents only. "The building looks lovely," she said. "But what green can the public get into?" When Ingels and Durst struggled to answer, she replied, "As time goes on, that might be an issue...We're a pain-in-the-neck neighborhood." For the board, adjacency to the Hudson River greenway is not enough. No decisions were made at the introductory meeting and W57 must still undergo a series of approvals including gaining proper zoning to allow a residential tower on the site in the first place. We told you this morning about new details surrounding the Durst Fetner Residential's Bjarke Ingels-designed West 57th Street tower, but now there so much more to share. BIG's Danish office has released additional renderings, detailing Manhattan's surf-and-turf hybrid tower in all it's mountainous glory. And you won't want to miss the fly-by video, either! As Bjarke Ingels has said before, West 57 is all about typological diversity, combining elements through what he calls his Manifesto of Bigamy. Ingels' design language is apparent in his first American design beyond the obvious mountain and sailboat references of its overall form. Equally iconic moves include meticulously crafted views shaped by the central courtyard and a jagged floor plan that creates a highly textured facade. At 467-feet tall, West 57 is slated to contain over 600 residential units, including 20 percent of units marked as affordable. Durst, developer of the LEED-Platinum One Bryant Park Tower, also plans to push for LEED Gold in Hell's Kitchen. “New York is rapidly becoming an increasingly green and livable city. The transformation of the Hudson River waterfront and the Highline into green parks, the ongoing effort to plant a million trees, the pedestrianization of Broadway and the creation of more miles of bicycle lanes than the entire city of my native Copenhagen are all evidence of urban oases appearing all over the city. 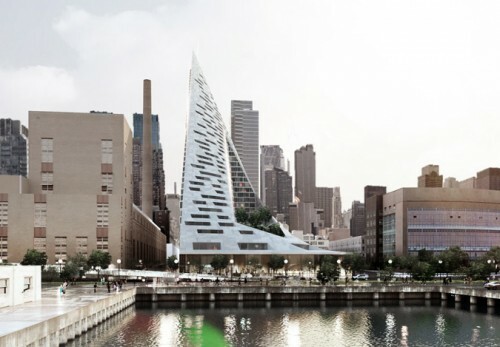 With West 57th we attempt to continue this transformation into the heart of the city fabric – into the center of a city block,” Bjarke Ingels said in today's release. Surf-and-turf sure is delicious! We've been eagerly awaiting news from Bjarke Ingels' New York debut on 57th Street in Hell's Kitchen, and today, the Durst Organization, project developer, has released new details of New York's mountain-to-be. New York magazine got the exclusive, this weekend revealing a new rendering of the 450-foot-tall apartment tower poised to redefine the architecture of the stodgy box. Last month, Ingels was guarded in discussing his ambitious plans for New York, but he wasn't kidding when he told AN of his intention to wed the traditional European courtyard block with an American skyscraper. And appropriate to Ingels' emerging philosophy of "bigamy," exemplified by the classic American surf-and-turf, the new tower simultaneously resembles a snow-capped mountain peak and a white-sailed vessel docked on Manhattan's west side. 57th Street's form responds to disparate site conditions with requisite thought and artistry of any BIG project. 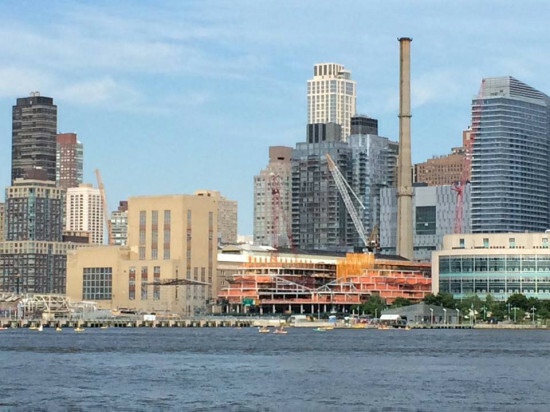 Ingels told NY magazine that the building's form pushes for a "blatant" connection to the Hudson River greenway while responding to multiple challenges on a site clinging to its industrial past, including adjacency to an elevated highway and a parking garage for garbage trucks. 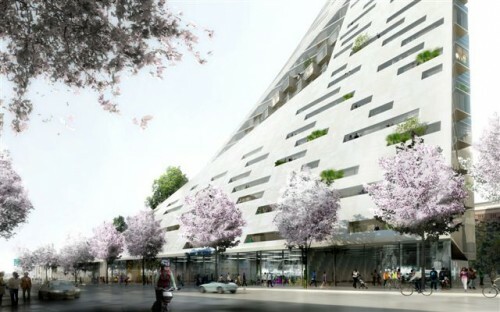 The tower slopes and twists to avoid blocking views while also reducing traffic noise. Just as Ingels promised, the tower features a lush, landscaped courtyard sliced into the middle of the rising mountainside, forming a sort of soft, green oasis along the building's sharp ascent. Balconies have also been pierced into the facade in a similar manner. The design still faces a series of regulatory hurdles in coming months, beginning with a community board meeting this Wednesday. We'll be watching Ingels closely, so stay tuned for a mountain of updates!